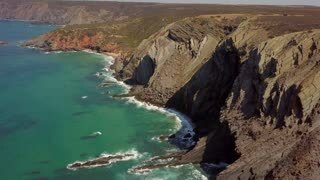 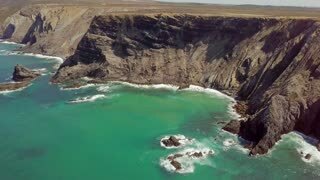 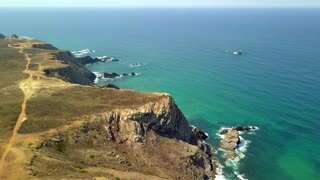 Landscape from drone with view of desert terrain with beautiful shoreline of ocean washing rocky cliffs in sunlight, Algarve, Portugal. 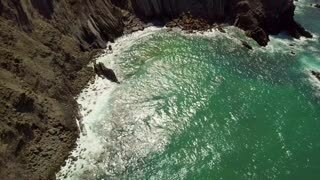 Aerial view from drone of tropical sunlight reflecting in turquoise water of ocean washing rocky shoreline of Algarve, Portugal. 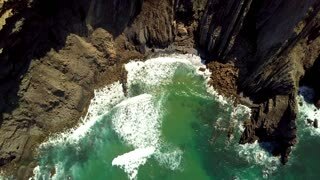 Aerial panorama of blue ocean water washing rocky coastline with high rough cliffs in tropical sunlight, Algarve, Portugal. 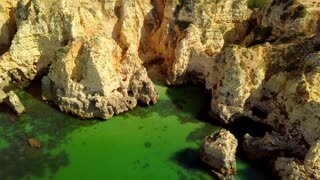 Shot taken with flying drone of green ocean water washing coastline with rough white cliffs in bright tropical sunlight, Portugal, Algarve. 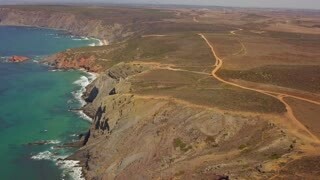 Aerial shot of spacious terrain on high cliffs of tropical shoreline with turquoise water of ocean washing rocks below, Algarve, Portugal.